It is Narendra Modi's first visit to the state after the ruling Telugu Desam Party severed ties with NDA. Vijayawada: TDP workers staged protests against Prime Minister Narendra Modi as he arrived Sunday on his first visit to the state after the ruling Telugu Desam Party severed ties with the NDA. BJP leaders alleged that people were “thwarted,” from reaching the venue in large numbers and said countdown would start for Naidu when Modi commences his rally. This is Modi’s first visit to Andhra Pradesh, a year after the ruling Telugu Desam Party walked out of the BJP-led NDA. At Vijayawada and Guntur, TDP workers donned black shirts and took out rallies demanding that “Modi go back”. In his daily teleconference with the party leaders, the Chief Minister dubbed Modi as the “modati drohi” (first betrayer) of Andhra Pradesh. “Modi is coming for a war on AP. They have done all injustice to the state, destroyed the systems and ruined the country. Modi is facing protests wherever he is going in the country. He has come to AP to mock at us,” Naidu said. 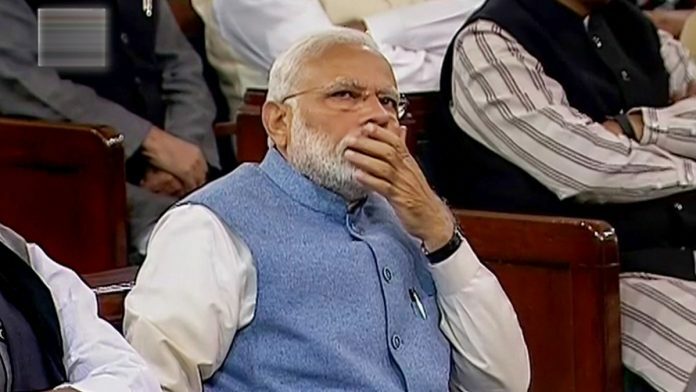 The Congress called for observance of black day on Sunday over Modi’s ‘failure’ to honour the promises made to Andhra Pradesh post-bifurcation, party sources said. In Vijayawada, the CPI and the CPI-M organised a demonstration Saturday protesting Modi’s visit. Reports said similar protests were held in Kadapa and Kurnool districts as well.